Chloe Silver has always been good at looking on the bright side. Even though her parents got divorced and she's moved to a new town, she knows that she will make great friends at her new school. So when she is assigned a science project with offbeat Lucy Tanaka and nerdy Theo Barnes, they have fun creating an experiment that tests out the laws of science through different acts of kindness . . . officially forming The Kindness Club. But when she is also asked join the cool girls' exclusive It Girls club, Chloe feels completely torn between the It Girls and The Kindness Club. Faced with the possibility of upsetting all her new friends, Chloe's capacity for kindness is put to the test. Sometimes mistakes yield the best discoveries, and there is one hypothesis that can always be proven correct: Kindness is the coolest. 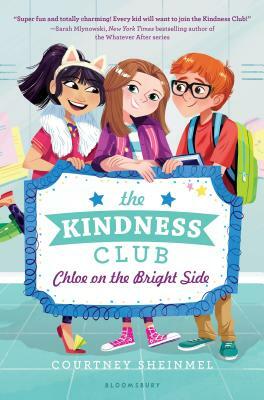 Inspired by kindness projects and anti-bullying campaigns across the country, the first book of this delightful series will have all readers thinking kind! Courtney Sheinmel is the author of the forthcoming Agnes & Clarabelle early chapter book series and YA novel, Edgewater as well as the YA novels My So-Called Family, Positively, and the Stella Batts series for young readers. Her books have received numerous awards, including the Sequoyah Award (Positively), a National Parenting Publication Awards honorable mention (the Stella Batts series), and have appeared on recommended lists, including the New York Public Library's Stuff for the Teenage, and the ABC Best Books for Children. In addition to writing, Courtney served as a judge on the national level for the Scholastic Art & Writing Awards, and she received a National Scholastic Outstanding Educator Award for her work as a writing instructor at Writopia Lab, a non-profit organization serving kids ages 8-18. Courtney lives in New York City.